Children with impulsivity and attention problem are usually difficult to complete a task in a given time. Moreover in the school setting, of course there is a time limit to be able to complete the tasks that have been given. Whereas, stage of development in the middle childhood children look themselves based on their ability to complete the tasks. It is feared if they fail in that case, then which will develop is an inferior feeling. Therefore, behavior to complete the tasks is important to be mastered by children especially in the middle stage of childhood. In addition, children who have hyperactive and impulsive tendencies usually will have difficulty to follow the rules and commands. One of way to shape the expected behavior is to apply behavioral modification interventions with positive reinforcement techniques. This research is a multiple baseline research using single case AB design method. The study participant was a boy aged 6 years and 3 months. The purpose of this study is to improve compliance behavior and task completion. The research was conducted to 9 sessions, each session consisting of 3 experiments. Positive reinforcement has been given each time the participant reaches the target behavior at each session. 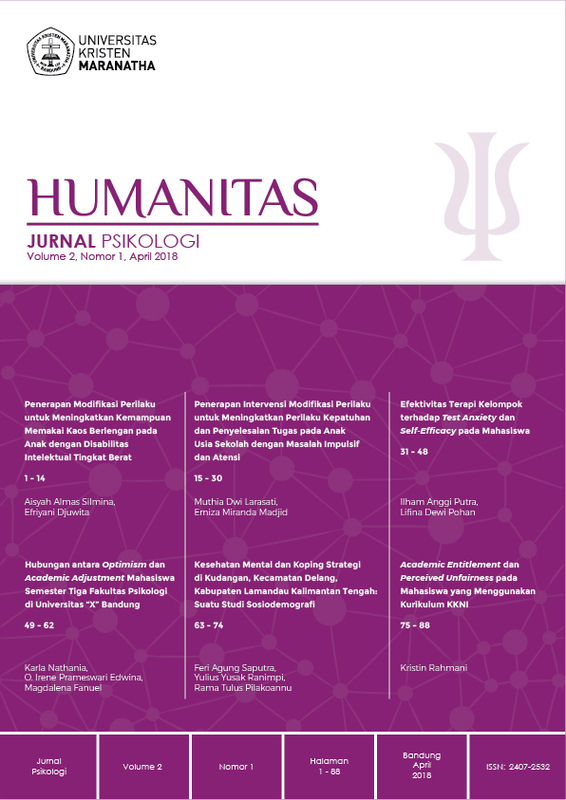 The results showed that positive reinforcement techniques could increase the frequency of compliance behavior (from 33.3% to 100%), completion of tasks (from 47.5% to 99.5%) and the effect of applying the intervention persists after the session is over.